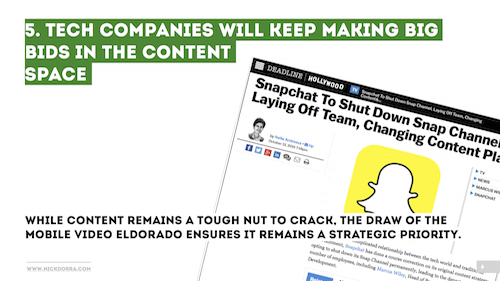 The relationship between content creators and tech companies leveraging that content can be a tricky one. Both industries hold half of the solution to the puzzle, and they have to figure out how to best work together. Content is king, but discoverability is the key to the kingdom. If you can’t unlock it, no-one’s going to see it – but it doesn’t matter how many keys you got if they lead you to a boring king (ok, I might have beaten that horse to death now…). Many companies will make big bets on proprietary technology or content production teams this year, and the rewards looming at the end of the rainbow are so huge, that no big player can afford to ‘reserve the right to play’ anymore. Creative approaches that utilize the native features of a tech platform, like the ‘Shield 5‘ story unfolding right now on Instagram, are a great seeding ground for bigger initiatives – don’t be surprised when Instagram recruits Anthony Wilcox to head a newly founded native content unit.